Italian food is generally very carb-heavy. 1 How Many Calories are in Cheese Lasagna? Italian cuisine is popular around the world, with many tasty dishes. Although some Italian food is low in calories and fat, many dishes are not. Italian food tends to be high in carbohydrates, because of the inclusion of pasta, but some low-carbohydrate options do exist. Exact nutritional values vary depending on recipes, so check nutrition facts when available. Penne pasta is a tubular pasta that is used in many Italian recipes and is often served on its own. Penne pasta provides 200 calories in each two ounce serving, according to LIVESTRONG's food database MyPlate. Penne pasta is low in fat, with one gram in each serving, and rich in carbohydrates, with 42 grams. Penne pasta offers two grams of fiber and seven grams of protein in each two ounce serving. Lasagna is a relatively high calorie Italian dish, as it contains pasta, sauce and cheese. A one cup serving of lasagna contains about 293 calories, with about 12 grams of fat, including 4.7 grams of saturated fat, according to MyPlate. 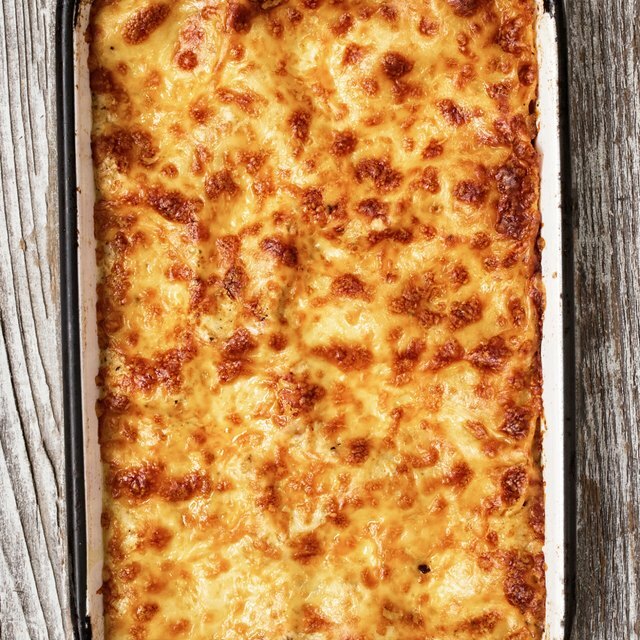 This serving of lasagna contains 31 grams of carbohydrates and nearly 15 grams of protein. Some lasagna is made with beef, which adds calories, protein and fat. Chicken Parmigiana consists of a breaded, fried chicken breast covered in cheese and tomato sauce. This dish can be quite high in calories, and a one cup portion provides 320 calories, according to MyPlate. Chicken Parmigiana is high in fat, with 11 grams (3.5 grams saturated fat), and provides 35 grams of carbohydrates and 22 grams of protein. Ravioli resemble pillows of pasta that are stuffed with cheese. A one cup serving of ravioli contains 220 calories, according to MyPlate. This portion of ravioli contains 3.51 grams of fat, with 33 grams of carbohydrates and six grams of protein. Ravioli may have different fillings, such as spinach, squash, beef or even lobster. Manicotti are long tubes of pasta filled with cheese and covered in tomato sauce. Two manicotti contain about 270 calories, with 10 grams of fat (five grams of saturated fat). This serving of manicotti contains 31 grams of carbohydrates and 13 grams of protein, according to MyPlate. Italian wedding soup contains noodles, beef and vegetables. This soup is low in calories, with anywhere from 100 to 140 per cup. The soup has 2.5 to five grams of fat (one to two grams of saturated fat), 13 to 16 grams of carbohydrates and six to seven grams of protein, according to MyPlate.